The current issue of ANS is now available on our ANS Web site, and it promises to another issue of lasting influence! If you have not already done so, take a look at the Table of Contents and see for yourself what this issue contains. We will be featuring each of these articles in the “Featured Articles” section of the web site, and while they are featured you will be able to download them at no cost. If you are a journal subscriber, you have access to all of the articles in not only this issue, but all issues of ANS published since the beginning in 1978! Given that ANS articles are unsolicited, we can never predict the content profile of any single issue. We publish issue topics well in advance of the date by which manuscripts must be submitted to considered for each issue, but we leave the interpretation of issue topics open. But for this issue of ANS, I anticipated that authors might address two substantive areas – trauma and stress brought about by war, and that brought about by violence in the home. Indeed, both of these areas of concern appeared in the articles we considered for publication, as well as those that were accepted for publication. Predominantly, nurse authors represented in this issue addressed various aspects of trauma experienced by women and children. Indeed, as I wrote in my editorial for this issue, war begins at home. It is in the home, in the place that is supposed to be a safe haven, that is the very place where women and children are the most vulnerable. Regardless of the physical location where nurses are in contact with patients and families, our work and the perspective that we bring to our work creates a window into what happens at home. So it is incumbent upon us to have a strong base of knowledge about violence in the home, and effective ways to intervene and create healing. 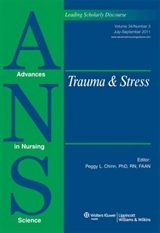 This issue of ANS adds to the extensive evidence that underpins the imperative for all nurses to incorporate into their practice sensitivity to the possibility for trauma that is perpetrated against women and children in the home, and to incorporate into our practices effective approaches to care that address healing for those who are affected. This issue is rich with content that enriches nursing knowledge of this phenomena, and with evidence to guide practice. 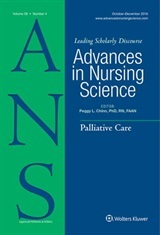 This is exactly the purpose of ANS to present substantive content that contributes to the development of nursing knowledge that serves to guide practice. So browse this issue — you will not be disappointed! As to the war that begins in the home, which I think is accurate, I have a suggestion. Most abusers of children are parents, which is hard to swallow. Neglect is the most common form of childhood maltreatment. And figures vary, but perhaps 1 in 4-6 children suffer sexual abuse alone. Currently 1/5 of children live in poverty in the US and that jumps to at least 1/4 for children who are African American. My suggestion is that as a society, but particularly as nurses and teachers in schools we might assume any child could be maltreated at home (this crosses SES), and children seldom report this for a variety of reasons. Likewise we should be vigilant for hunger, and other signs of neglect. Add to this the growing problem of bullying in the schools, and I see the need for establishing safe zones in schools where children can have respite from violence and neglect. I realize the economy we are in is tough. To insist on these kinds of answers we just have to be tougher. Elections are crucial, but there is money in the system that is going to other “priorities” such as war spending. To oppose this means collective organizing. National Nurses United is an excellent example of just such an effort. I urge all to check them out and become members. Here is a chance for academic nurses to join a grass roots nursing movement. Thank you so much for adding this important resource to this discussion, Joanne!